BUSH’S Beans advises people to make chilli instead of going out in a new commercial, promoting the Chili Beans. 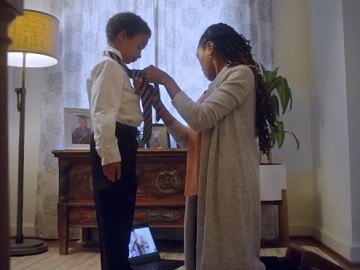 Dubbed “Tie Vortex”, the 15-second spot features a mother trying to tie her little son’s tie before going out. Even though she’s watching a dedicated tutorial on her laptop, she doesn’t manage to do it, so they both agree to give up trying. “Don’t go out. Make Chili. Goodbye Fomo, Hello Jomo.” – flash across the screen at the end of the ad, with the explanation of “Jomo”: “Joy of Missing Out”. The baked bean brand’s range of products also includes Mixed Chili Beans, Kidney Beans in a Spicy Chili Sauce, Organic Black Beans, Baked Beans, Grillin’ Beans, Savory Beans, COCINA LATINA Beans, inspired by regional recipes, in a variety of flavors, like Frijoles Cubanos, Frijoles A La Mexicana, Pintos A La Diabla, and more. According to BUSH’S Beans, these beans are “naturally gluten-free and cholesterol-free” and “are picked at the peak of perfection”.